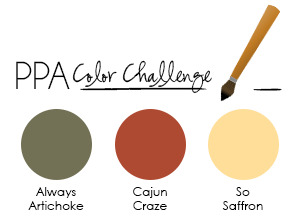 Here is the color palette to be implemented in the PPA175 Challenge. Not your typical Christmas colors, but I thought I would see what I could do with it. To see the other cards submitted for this challenge click here. I used Cajun Craze card stock for the base, and ran a 5 1/4”x 4” piece of Always Artichoke card stock through an embossing folder with an evergreen and berry design for the next layer. I stamped the tree in Artichoke, the star in Simply Saffron and the planter in Cajun using the Pennant Parade stamp set. To create the Saffron frame, I cut the tree out with an oval framlelit and used the same size framelit inside a larger oval framelit. I used a paper hole punch to create the circles of Cajun, and placed the smallest pearls from the Basic Pearls inside them, for a bit of ta-da. I glued a pinch of dazzling diamonds on the star and added some glitter candy dots as the ornaments. To complete the card I stamped merry from the Pennant Parade stamp set in Real Red, cut with an 3/4" x 15/16" oval punch and popped up with dimensionals. Posted on October 13, 2013 by Martie Pollard.